Egypt is probably the world’s oldest civilization having emerged from the Nile Valley around 3,100 BC, historically. Egypt is probably one of the oldest vacation spots. Early Greeks, Romans and others went there just for fun, and to see the wonders of some of mankind’s earliest triumphs. But Egypt is much more than Pyramids and monuments. It is also Red Sea scuba diving, hot night spots, luxury hotels and five star restaurants. It is romantic cruises down the Nile on festive river boats, a night at the grand opera and it is a cultural experience like none you have ever experienced. Egypt is a land bustling with life, sound, visual beauty and excitement. More than anything else, we want you to think of Egypt as fun. For thousands of years, it has been the playground of emperors and kings, and we hope you will take the time to find out why. At 1,001,450 square kilometers (386,660 sq mi), Egypt is the world’s 38th-largest country. In terms of land area, it is approximately the same size as all of Central America, twice the size of Spain, four times the size of the United Kingdom, and the combined size of the US states of Texas and California. Nevertheless, due to the aridity of Egypt’s climate, population centres are concentrated along the narrow Nile Valley and Delta, meaning that approximately 99% of the population uses only about 5.5% of the total land area. Egypt does not receive much rainfall except in the winter months. South of Cairo, rainfall averages only around 2 to 5 mm (0.1 to 0.2 in) per year and at intervals of many years. On a very thin strip of the northern coast the rainfall can be as high as 410 mm (16.1 in), with most of the rainfall between October and March. Snow falls on Sinai’s mountains and some of the north coastal cities such as Damietta, Baltim, Sidi Barrany, etc. and rarely in Alexandria, frost is also known in mid-Sinai and mid-Egypt. Temperatures average between 80 °F (27 °C) and 90 °F (32 °C) in summer, and up to 109 °F (43 °C) on the Red Sea coast. Temperatures average between 55 °F (13 °C) and 70 °F (21 °C) in winter. Egypt is divided into 29 governorates. The governorates are further divided into regions. The regions are then subdivided into towns and villages. Each governorate has a capital, often carrying the same name as the governorate. Egyptian culture has six thousand years of recorded history. Ancient Egypt was among the earliest civilizations and for millennia, Egypt maintained a strikingly complex and stable culture that influenced later cultures of Europe, the Middle East and other African countries. After the Pharaonic era, Egypt itself came under the influence of Hellenism, Christianity, and Islamic culture. Today, many aspects of Egypt’s ancient culture exist in interaction with newer elements, including the influence of modern Western culture, itself with roots in ancient Egypt. Egypt’s capital city, Cairo, is Africa’s largest city and has been renowned for centuries as a center of learning, culture and commerce. Egypt has the highest number of Nobel Laureates in Africa and the Arab World. The major destinations of Egypt include all the tourist attractions in the country and the places, which are important in terms of business and economy. Egypt is the most populous country of Middle East. Most of its population resides near the Nile River. 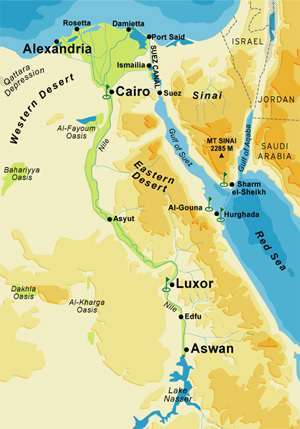 Except of the Nile River Valley region most of the area of Egypt is arid forming deserts for what Egypt is also known for. However inspite of this geographical diversity, Egypt destinations showed existence of Egyptian culture in its true colors and shades. Popular destinations in Egypt present the perfect example of harmonious fusion of glorious past of Egypt with modernity. From the metropolitan capital city of Cairo to the city of Pyramids-Giza and from Luxor that houses world’s largest temple complex to the city of port-Alexandria, every city of Egypt is full of attractions. From the historic cities like Cairo, Giza, Luxor, Aswan or Alexandria to the fast developing tourist and modern cities of Hurgahada and Sharm el Sheikh, Egypt is the main political and cultural center of Middle East.